﻿ Punk bands just don’t know when to call it quits. Whether it’s the remnants of their original DIY ethos or simply the necessary way of keeping their wheels spinning, the length of time that the genre’s old guard manage to hang on for is undeniably impressive. For Rancid though, the latter option feels clearer than with most, especially with their most recent material, 2009’s Let The Dominoes Fall that fell drastically short of expectations, and 2014’s Honor Is All We Know which, with its hype-free roll-out and lack of momentum, remains a virtual non-entity in the band’s back catalogue. At times, it feels like new music from Rancid is a pointless exercise; compared to a band like Green Day whose remaining widespread relevance justifies new releases, Rancid could easily keep their cult audience happy with greatest hits shows and little else. At least Trouble Maker feels a bit closer to the mark, but it still packs a few issues that stop it really connecting as well as it could. For one, this album cannot justify being seventeen tracks long, given how Rancid barely have enough independent ideas to hit half of that. When they stray into ska-punk on Where I’m Going or adopt a glam-rock strut on Bovver Rock And Roll, there’s some variety that makes Rancid feel like a much fresher prospect, but when it’s countered by a near-constant focus on the more melodic side of street-punk, the lack of ingenuity starts to become critical, particularly in the final third when ideas really start to come back up again. It’s not a long album – seventeen tracks and 36-minutes long, with only three of those breaking the three-minute mark – but at the frequency that an already restrictive sound is recycled, it feels a lot longer. And speaking of recycling, the concepts of nostalgic throwbacks, gang mentalities and a love of punk itself are as thrilling as ever in small doses, but when they’re spread so thinly over virtually the entire thing, some punch and vigour that’s really necessary is lost. Songwriting doesn’t have to be a necessity, especially in punk that deals in fast and loose vibes like this, but it’s certainly preferable to shallow repetition like on I Kept A Promise and Cold Cold Blood that could’ve been left off with no consequence. The thing is though, brush away the chaff, and Trouble Maker has moments that see Rancid at the most vibrant and switched-on they’ve sounded in years. Not Tim Armstrong of course, who’s still doing his slurred, half-awake hobo impression, but with guitarist Lars Frederikson once again serving as his more sober, intelligible foil and an energy to the instrumentation that doesn’t betray a band who are currently nine albums deep, Rancid are able to rely on a decent carrying of melody above anything else to get them by. There’s a spryness and bounce to Telegraph Avenue and Farewell Lola Blue that shows minimal rust in their joints, and tracks like Ghost Of A Chance, An Intimate Close Up Of A Street Punk Trouble Maker and Say Goodbye To Our Heroes are the sort of rabble-rousing shots of fire that Rancid still traffic in at their best. Even if the steam does visibly begin to run out towards its tail end, Trouble Maker still has its fair share of quality moments that can be pulled out. Plus, it’s a lot better than Rancid’s last couple of albums on the whole, simply by having some much-appreciated drive. For the amount of filler here that could’ve easily been left out for a much leaner, more direct album, Trouble Maker can at least hold its own with sporadic highlights that do actually manage to connect. Rancid may be seen as past their use-by date for some – perhaps even more so given their recent track record – but Trouble Maker is solid enough to move back towards the right path, even if they aren’t quite there just yet. 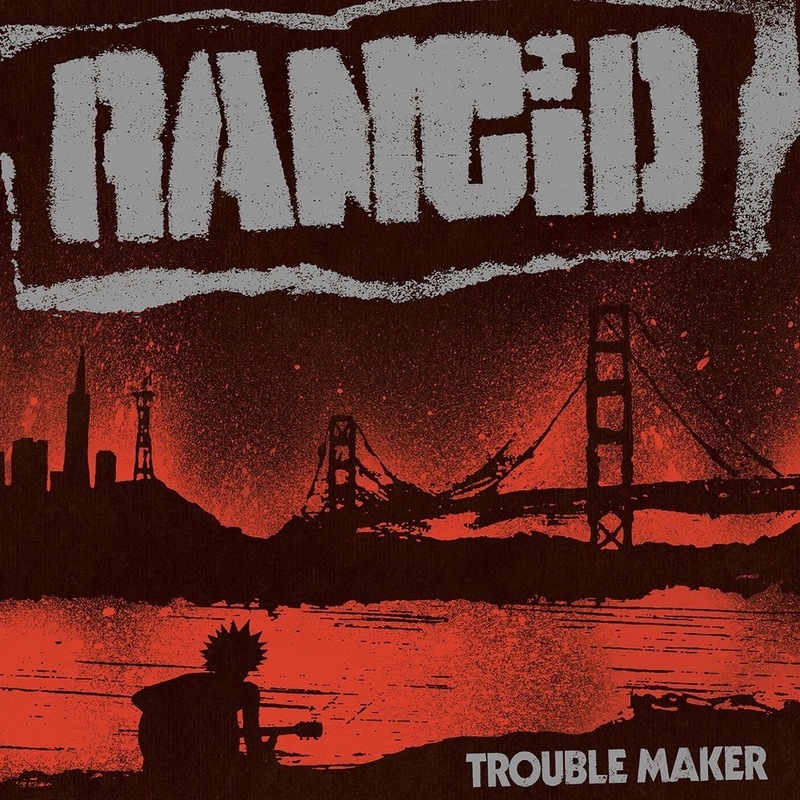 ‘Trouble Maker’ by Rancid is out now on Epitaph Records / Hellcat Records.